Even a newbie to the world of baking can knock these Strawberry Cobbler Bars out of the park, and I’m here to show you how. 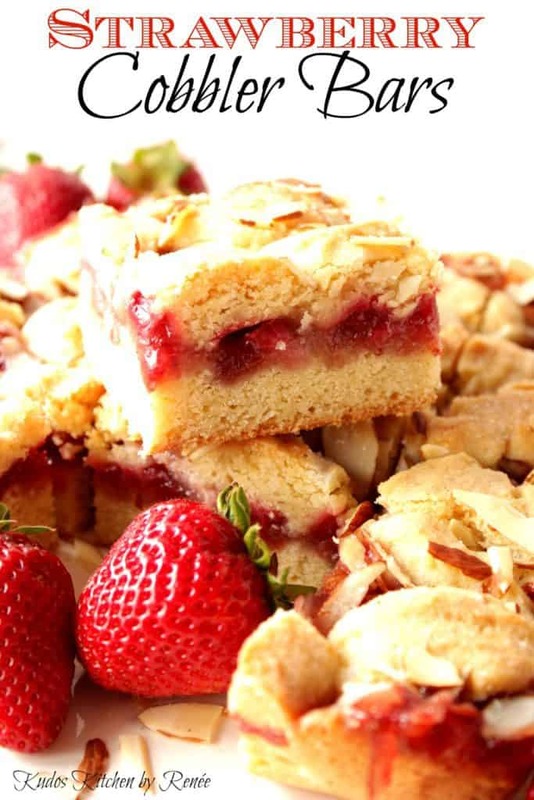 You’re going to love the flavor and ease of these Strawberry Cobbler Bars. The dough is sweet, but not overly. 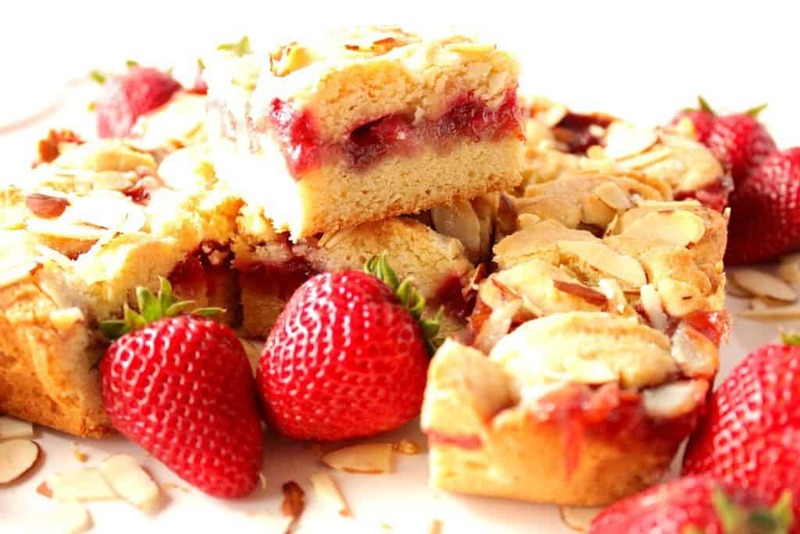 And the strawberry filling is soft and tart, which is the perfect compliment to the crunchy almonds and sugar sprinkled topping that ever so lightly kisses these delicious dessert bars. Beyond the flavor of these bars, what you’re really going to love is how fast and easy they are to assemble and bake. There is no electric mixer required, and the ingredients are basic refrigerator and pantry staples such as flour, sugar, butter, eggs, strawberry jam and a handful of fresh strawberries. These bars are so easy to make that even a novice baker can turn these out like a pro, and then stand back and take a big bow because you’ll be hearing some applause. I made you a quick video to show you just how simple they are to make. I hope you enjoy it. Subscribe to my YouTube channel. 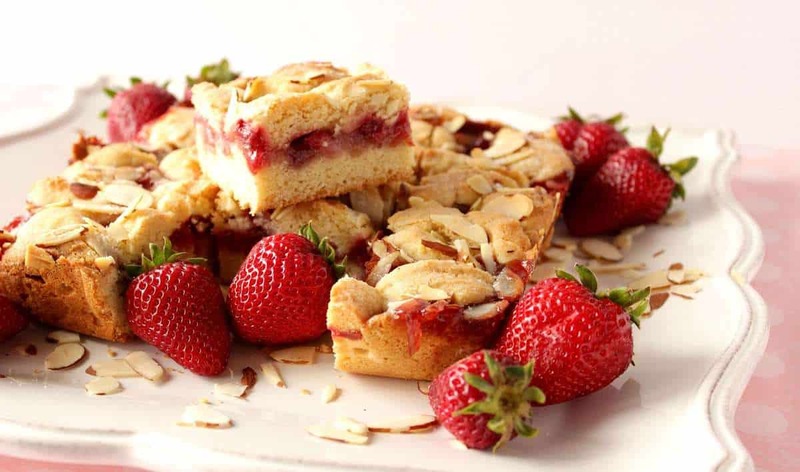 A quick tip and trick I used in making these Strawberry Cobbler Bars easy to remove from the baking pan after baking is to line an 8″x 8″ baking dish with aluminum foil, and liberally spray the pan (and foil) with baking spray. Making sure to leave enough foil overhang on two sides of the pan is the key to being able to grab the foil and gently lift the bars out of the dish and onto a flat surface for additional cooling before slicing into bars. Line the baking dish with the aluminum foil making sure to leave a few inches on two ends of the foil to grab and lift after the bars are fully baked. Liberally spray the dish and the foil with baking spray. Set aside. In a large bowl, whisk together the butter, egg, and vanilla until combined. Add ½ cup of granulated sugar and whisk until smooth and creamy. Switch to a wooden spoon or spatula and stir the flour mixture into the butter and sugar mixture until a smooth, soft dough forms. Spoon half of the dough into the prepared baking dish and with a spoon or offset spatula, smooth the dough evenly over the bottom of the pan. Place the strawberry jam over the crust layer of the bars, and use a spoon or offset spatula to evenly spread the jam over the dough. Top the jam with an even layer of sliced strawberries. Use the remaining dough to evenly dollop over the entire top of the strawberries. Sprinkle the top of the dough with the sliced almonds and 1 tablespoon of granulated sugar. Bake in a preheated oven for 40-45 minutes or until the dough is golden brown. Remove from the oven and cool on a wire rack for 30 minutes. Remove the cobbler bars from the semi-cooled pan by gently lifting, using the aluminum foil excess on the opposite sides of the pan. Place the semi-cooled bars on a flat surface and allow to cool completely. If you don't have an offset spatula, the back of a spoon will work equally as well. To make these bars patriotic themed, add a few fresh blueberries along with the sliced strawberries and continue as written in the recipe. 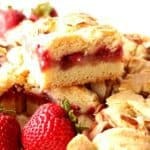 These easy to make Strawberry Cobbler Bars would be perfect to serve a small gathering for breakfast, lunch, dinner, or even brunch. They’d also be perfect to whip up for a Mother’s Day celebration, or, with the addition of a few fresh blueberries, they’d make a delicious red, white, and blue patriotic dessert for Memorial Day or the Fourth of July. Can’t you just picture it? 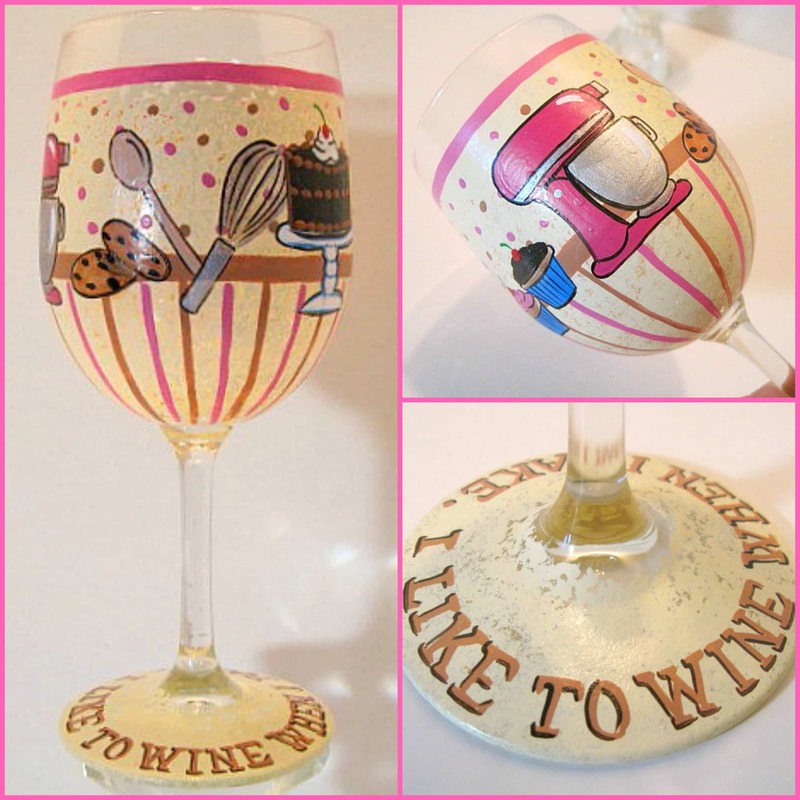 I’ve decided to coordinate today’s recipe with this “I like to WINE when I bake!” hand painted wine glass because I think it’s funny and appropriate (if you’re over 21 of course). Each and every item I paint is completely painted to order and unique. Custom glassware is always available, and each and every glass I paint comes in its own gift box, making them perfect for gifting. Together, we give the gifts that people remember! If there is ever anything I can paint for you, from glassware to fabrics, please don’t hesitate to contact me or visit one of my shops. You can find me on Etsy, Wazala, and my new location: Kudos Kitchen Paints. Special, custom orders are always available, and I will happily paint and design from any photo, idea, or description you send my way. These look delicious! 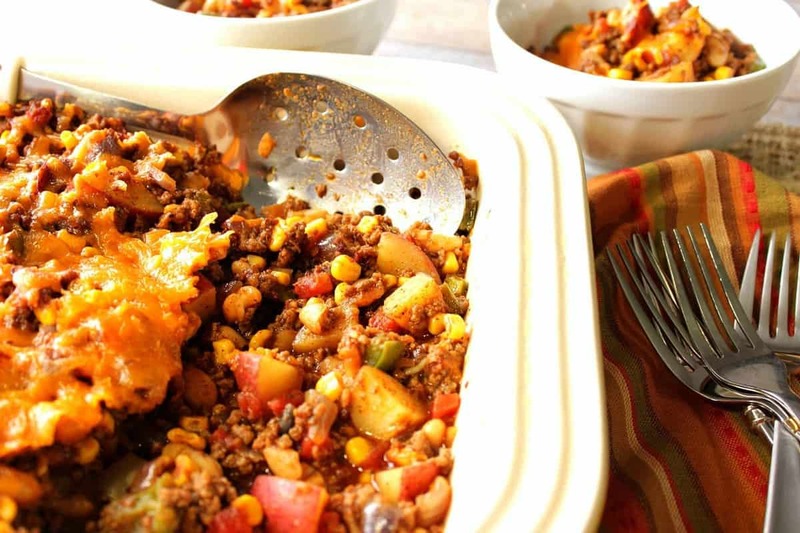 I love the trick of lining my pans with foil first – such a time/mess saver! I think they serve better too using the aluminum foil. It’s so much easier than trying to dig them out of the pan after they’ve been sliced. 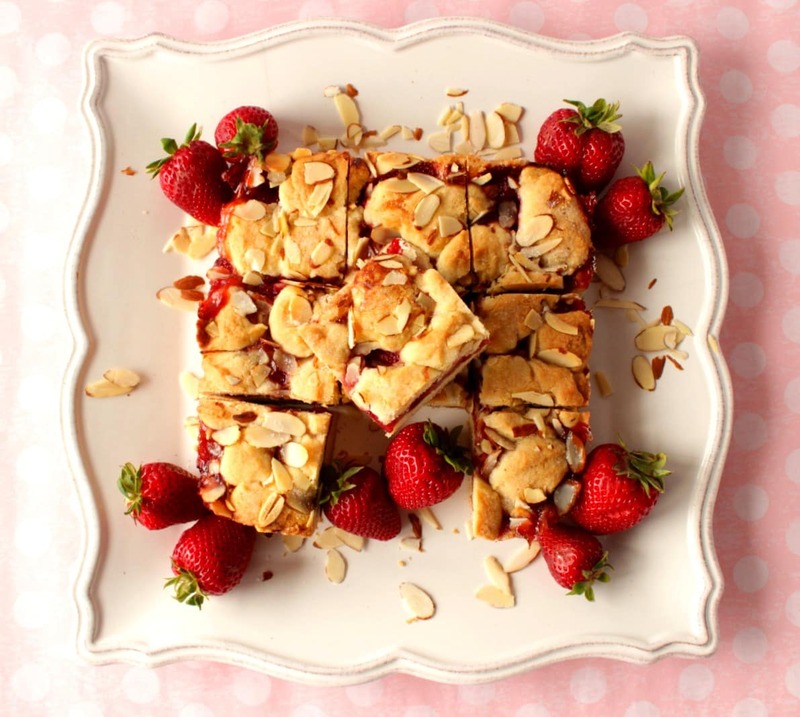 Nothing makes me sadder about my strawberry allergy than recipes like this. Do you think it would work just as well with raspberry or blueberry jam and fruit? haha! What cute wine glasses! And those bars look amazing! 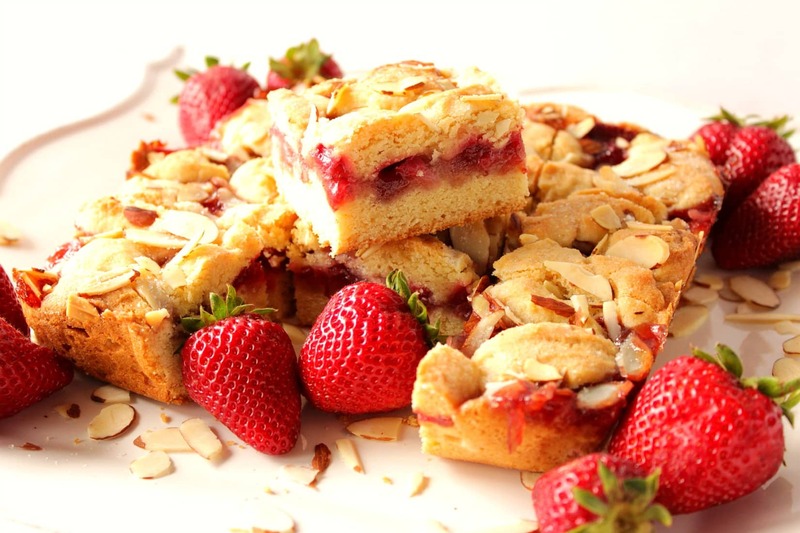 I love making fruity cobbler bars with fresh fruit. They are so yummy!! I agree, Karyn. They’re especially yummy when fresh berries are in season! These look so, so yummy! I love how thick they are and how many berries are loaded inside. 🙂 I tried something similar recently and totally failed. And those wine glasses are so fun! I am loving strawberries lately! I can’t wait to make these! I am so excited for strawberry season! Can’t wait to make these bars! Wow – these look beautiful! You’re photos are gorgeous, and I just really love these bars! 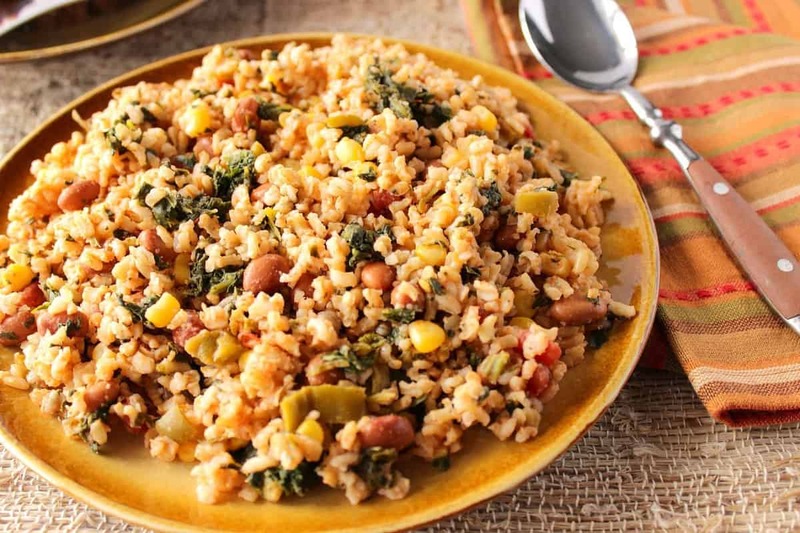 Love the almonds for added crunch, too. Can’t wait to try these — soon! Ooo! 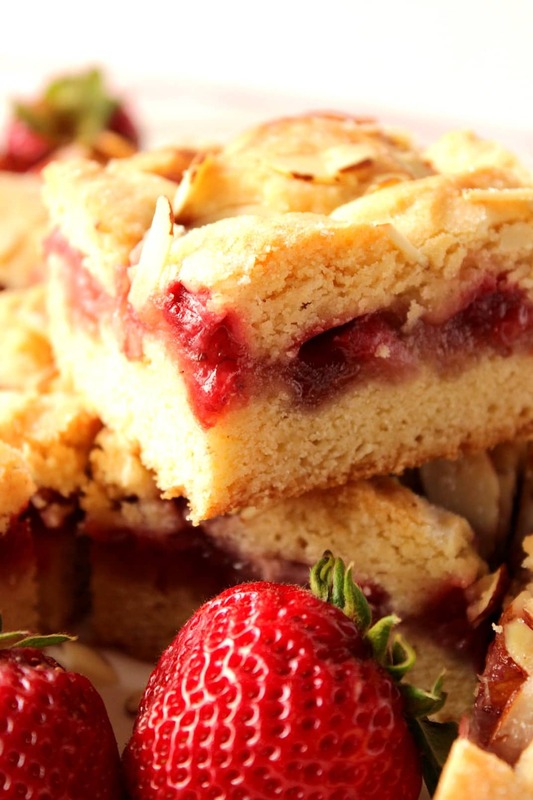 Fruit bars usually end up a mushy mess, but these look so cake-y and perfect. I can’t wait to try them. These look like a great spring treat! And I love the idea of lining the pan with aluminum foil. It really does make getting bars out easier! Oh, these bars. I cannot wait to try these — and such an accessible ingredients list. My goodness….these look amazing! The perfect bars for summer picnics!